Moabtruck.com is a member of the MoabLive.com network of websites. The mission of MoabLive.com is to increase the public's awareness of the beauty of national parks and national monuments in the West, and the preservation of unique landforms and enhancement of outdoor lifestyles. A complete listing of all domains owned by MoabLive.com may be accessed at the bottom of this page or the Links Page at Moablive.com. Each October, I make it a point to visit Moab, Utah. By then, it is the shoulder season, with warm days, cool nights and many happenings around town and beyond. On October 6-7, 2012, I covered the last and final 24-Hours of Moab Mountain Bike Team Relay Race, Behind the Rocks near Moab. 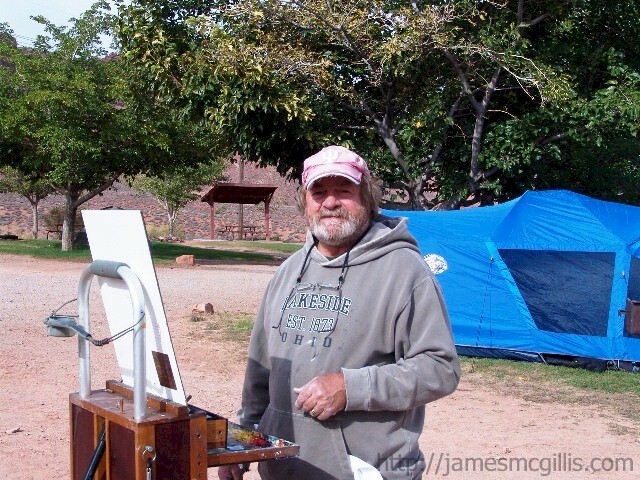 That same weekend, PleinAir Moab ’12 brought artists from all over the country to Moab for some fast-action outdoor painting. The prior year, I had stopped on a Downtown sidewalk to watch woman paint. Before my eyes, she recreated Pasta Jay’s Restaurant. This year, when I saw a man setting up his easel behind the office at the Moab Rim Campark, I knew just what he was doing. Not wanting to miss the action, I grabbed my camera and headed outside. By the time I arrived, artist Larry Rudolech had already sketched his subject in charcoal or graphite. After introducing myself, I asked if Larry would allow me to document his creation. In the “Quick Draw” format of PleinAir, I knew that Larry’s current painting would be hanging in the competition room Downtown in less than four hours. Graciously, Larry allowed me to photograph his sketch. We also conversed about his paint preparation and painting technique. One reason that I was interested in Larry’s work was his subject matter. I too had studied his subject for over five years. 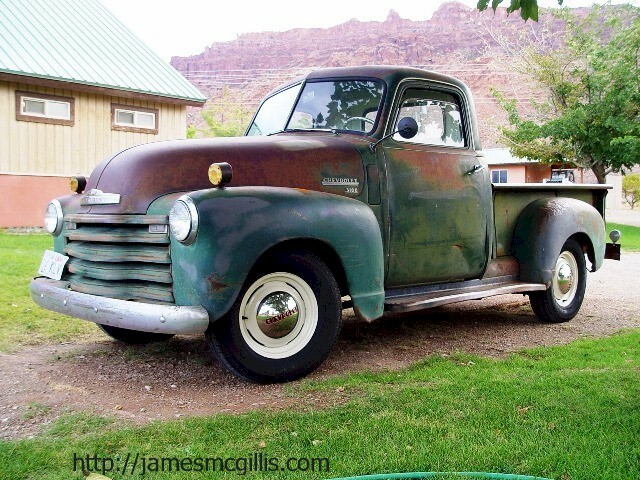 In 2008, I first discovered Jim Farrell’s 1950 Chevrolet 3100 pickup truck. 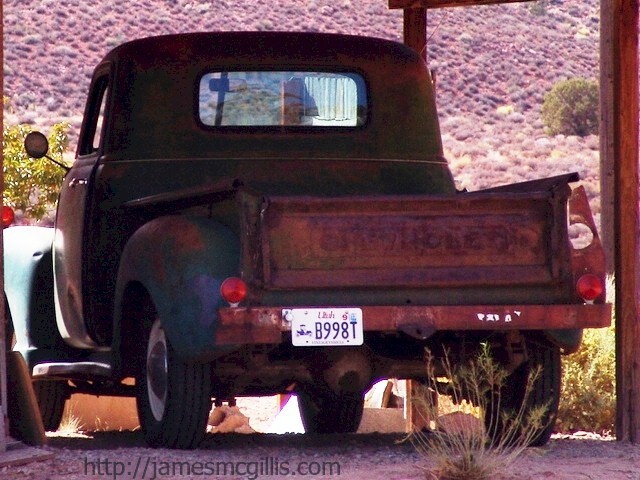 By the looks of Jim's old Chevy, I surmised that it had been in Moab since it was new, over sixty years ago. Like an old park ranger truck, once it had been painted forest green. Now it was equal parts fading green paint and hard-finished rust. 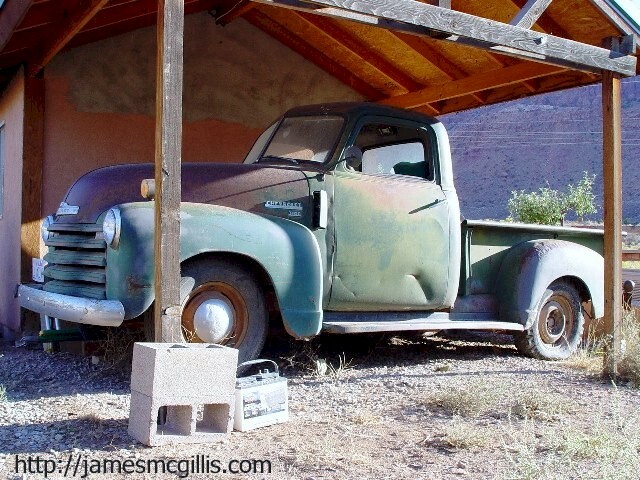 I photographed the old truck in the carport where it stood, its front end raised up on blocks. It was obvious to me that the truck did not run. 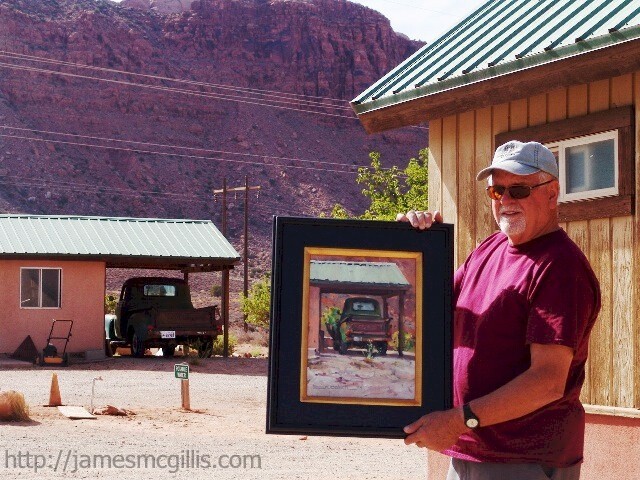 After reviewing my photographs, I asked Jim Farrell about his truck. “Well, it still worked when I bought it, but once I got it here, it wouldn’t go any farther.” With a wistful look on his face, Jim said, “I plan to fix it up some day”. Three years later, in 2011, I found Jim’s truck parked under a tree by the office. With new hubcaps, gauges and wiring, Jim Farrell was back in the Chevy truck business. As the Rainbird played water over the cab, I hoped that its windows were waterproof. Thinking of the great hospitality that Jim Farrell and his wife, Sue had shown me over the years, I decided to purchase Larry’s PleinAir painting and present it to them as a gift. Although the price of Larry’s art was reasonable for an original oil painting, I quickly realized that my budget was too low. Once again, I said, “So much for that story”. The next day, I walked in to the Campark office, only to find Sue Farrell showing off a new painting that she and Jim had just purchased. 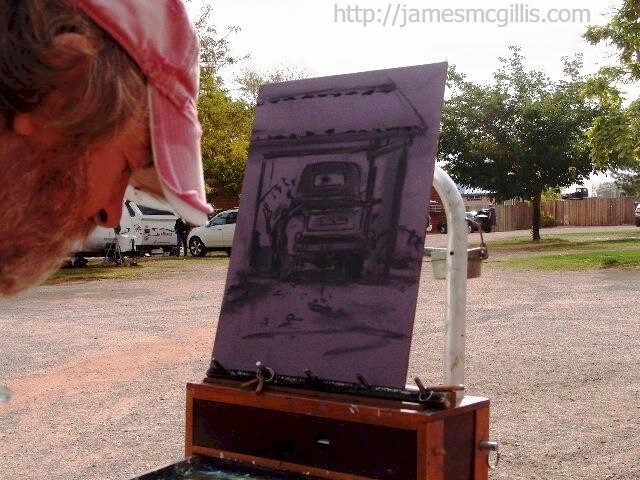 Of course, it was Larry Rudolech’s PleinAir painting of Jim Farrell’s old Chevy pickup. After taking photographs inside, I asked Jim Farrell to come outside with me. There, Jim held up his new artwork, with the truck itself in the background. As the reader will see, Larry has an uncanny ability to sense both the whole scene and the details necessary to convey a separate, miniature reality to the viewer. To me, Larry’s work was impressionism at its finest. Later, via email, Larry Rudolech told me about the great time he had in Moab that week. Following is a synopsis of Larry’s email to me. 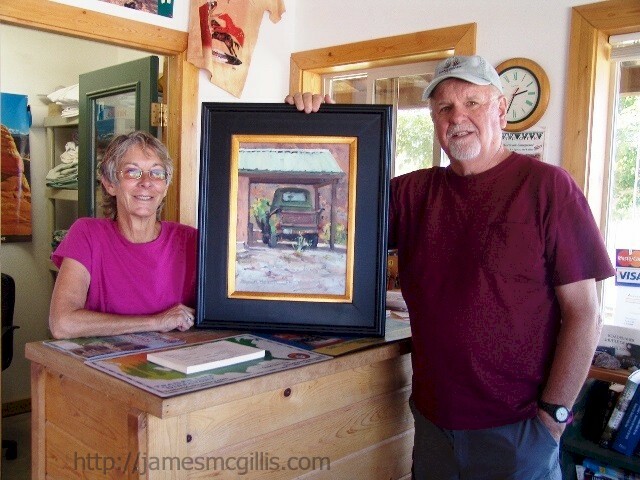 “Ok here you go… I am sending you a photo of the Best of Show Award at the Moab PleinAir Event… and Yes, I think Jim and Sue were happy with their painting. I was very surprised and honored to be chosen as this year’s top award winner. The painting I won with was of four VW Buses at Tom Tom's VW Museum. I normally enjoy painting ‘the different’, and when I found the VW Junk Yard; I just had to paint it. I thought it was cute that people called it a Museum. When I heard the story behind the title of Tom Tom's VW Museum, I was even more pleased I had chosen to paint it. If Moab is the home of many wonderful landscapes, this I thought was a very good rendering of what Moab had become for me. The people of the area give more to Moab than some of the red rocks. After all, one red rock is like the other, but it is clear to see that one Moab resident is not like the other. This I think is one of the great things about Moab. I even began talking a lot about the many FREE SPIRITS of Moab. I am already looking forward to returning to Moab in 2013. Sometimes, when I am far from Moab, listening to the cold winds of winter, I allow myself to travel there in my mind. At my Moab, the days are always warm, but never hot. It is breezy, but not enough to kick up dust. Of course, the landscape is spectacular and the FREE SPIRITS of Moab abound. Around any corner, you never know whom you are going to meet in Moab. If you see Jim Farrell driving to town in an old green Chevy truck, please say “Hi” to him.